Here’s part three of a summary of a fascinating talk last week in L.A. by journalist Anand Gopal at the Brave New Foundation studio, connected through his help on the BNF film, “Rethink Afghanistan,” attended by a few CODEPINKers. The first part of the summary is here and second part here. Gopal devoted much of his talk to the conversation around Afghan women, one we've explored greatly here in our work against the war. Gopal explained that women’s rights have been pushed to the forefront and used as political propaganda in the war against Afghanistan. If nothing else, so they say, at least we are liberating the Afghan women. But the truth is, the lives of women in Afghanistan in many cases have not changed. In fact, they have worsened. The lives of women have only improved in urban areas. In Kabul, women are allowed to leave the house. Wealthy women are allowed to attend school and some who are well connected can even have a job. The same is true in the central highlands of Afghanistan. Outside of these two areas, however, women live a very different life. In those other areas, half of the population is missing. There are no women outside. Women are not allowed in the public sphere. Girls cannot go to school past puberty. An incredibly high number of women, 87 percent, in these areas suffer from domestic violence and 60 to 80 percent are in forced marriages. Of those women who are forced into marriage, 67 percent of them are under the age of 16. It comes as no surprise that women, therefore, have a high suicide rate. The hospitals are filled with women who have tried to kill themselves, mostly by lighting themselves on fire. Their life expectancy is only 42 to 43 years old, almost half of what it is in the United States. It is one of the most unequal societies in the world, only second to Sudan. The status of women in these areas have not changed, not one bit. The only thing that has changed is that in the areas where the Pashtun live they are living in a war zone. Women are still in prison either way. Because of the strict social codes, it proved to be difficult for Anand Gopal to interview women and allow their voices, which are normally silenced, to be heard. He found that the only real way around this was visiting the hospitals and talking with women who have survived a suicide attempt. By that point, the women felt they had nothing left to live for and could throw social norms out the window. One woman that Gopal spoke with had a story that is similar to many other women around the country. Her uncle came into her house and raped her. When the young Afghan woman told her parents, they became very upset because their family honor had been damaged. The family decided it would be best for her to commit suicide. Her mother poured the lighter fluid all over her body and then handed her a match to light herself on fire. Her suicide attempt failed and she was rushed to the hospital. She now has third degree burns all over her body. Her story is not unique; it is one of many in Afghanistan. While women’s rights is a major concern in the Middle East, and American media spends an enormous amount of time focusing on rights of Middle Eastern women, the U.S. has done little to actually help. Talk of "saving" Middle Eastern women is used more as a tool for political propaganda and a way to gain sympathy and support for the occupation. Around the world, as countries develop women often gain rights and increase their status as a result. 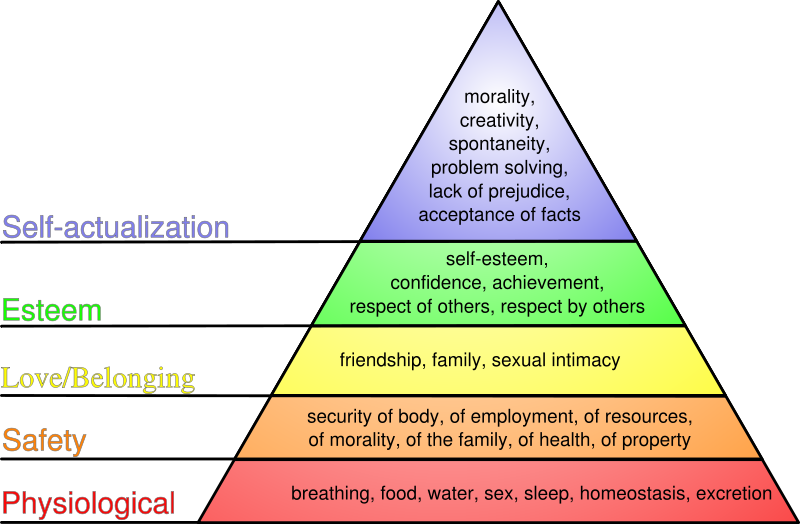 Similarly to Maslow’s hierarchy of needs, once people’s basic needs are satisfied they can work on satisfying higher level of needs, equal rights for all being one of them. If the U.S. really wanted to help women’s rights in Afghanistan and around the world, it should make development the number one focus and ensure that the money is being used to develop the country instead of fattening U.S.-based companies’ wallets.